We had a 7 hour journey ahead of us, and much to my relief we had three mini buses between the group so we got to spread out. On our way to Chiang Mai we stopped off at the famous Wat Rong Khun, or the White Temple, to have a look and take a few pictures. The temple was pretty impressive, different to many of the other Buddhist temples we had visited during our trip. It is a fairly recent addition to the list of temples in Thailand, opening in 1997 and was built by a Thai artist, Chalermchai Kositpipat, using his own money and is an ongoing project which has so far cost Chalermchai THB40 million (around £805,343.00). The main building illustrates the cycle of rebirth (the bridge) and gate of heaven (the gates). We didn’t get to go into the main building so can’t comment on that, but the outside was pretty confusing. In between the message of getting to heaven were all these terrible haunting images of suffering and pain. It is definitely a must see if you are in the area, and I can only imagine what the finished structures will look like. We carried on with our journey to Chiang Mai and arrived at a rather nice looking hotel. Once we’d settled in, we headed off in different directions to grab some food. I went to a small place just up the road from the hotel which I think was called the G’day bar. I had a lovely coconut curry soup dish, which had loads of flavour and was nice and warming as it was still on the cooler side of the thermometer. For our afternoon activity, a group of us had organised to do a cookery class. We got picked up by the lovely Oay and taken to the local markets to collect some ingredients. We also got to choose what we wanted to cook from a select list of dishes, which was great. I chose Chicken Coconut Soup, Pad Thai, Green Thai Curry and Mango Sticky Rice. After the markets, which was a lovely experience, it kinda reminded me of how the markets used to be in Birmingham before the redevelopment of the Bullring and Indoor Markets, we went to do some cooking at the cookery school Oay had opened at her house. 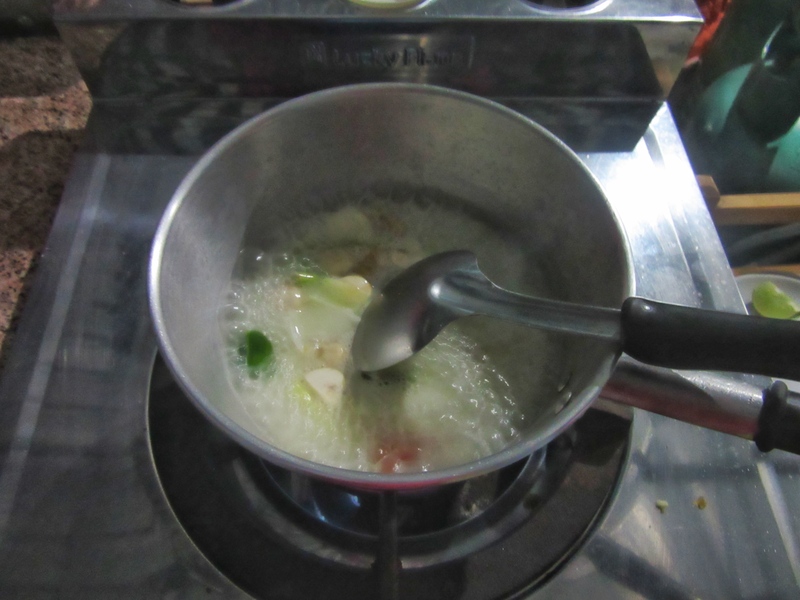 We all had our own little cooking stations, which meant that we would actually be doing the cooking, whereas with the cooking lesson in Hoi Ann we just made the food rather than cooked it. First up was the chicken coconut soup, which was in fact what I’d had for lunch that day, so I had an idea of what it should taste like. This one was lovely, but a bit on the spicer side for me so when I make it back home I may put less chilli in it. Next up was the Pad Thai. I love Pad Thai and I was really excited about making it myself so I could go home and make it for the bf who also loves it. There are quite a lot of ingredients that go into Pad Thai, so I was grateful for the little cookery book we got at the end of the class so I didn’t have to remember it all from photos. I felt that the Pad Thai was missing something, but I couldn’t, and still can’t quite put my finger on what it was. It was still tasty and so quick to make. 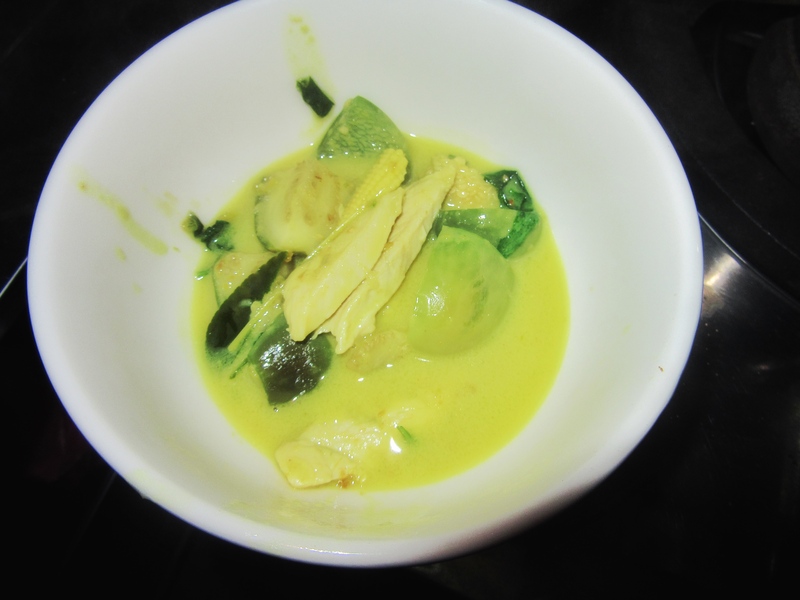 I made another of my favourite dishes, Thai Green Curry, and this one was possibly one of the best I’ve tasted, and that was with me cooking it. Although I don’t take the credit for it tasting good, it was obviously the ingredients and the recipe. Finally, although we didn’t get to actually make dessert, Oay showed us how to make it, I tried Mango Sticky Rice. It was so delicious, I can’t believe that I’d travelled through Asia without having already tried this amazing dessert! I was hooked. We’d all had an amazing evening leaning new skills and Oay was a great teacher. Some people were then heading out to watch either Thai Kick Boxing or a Ladyboy show, but I was so tired, and it was still quiet cold, how I’m going to cope when I get home I don’t know, so I just headed back to the hotel to catch up on my sleep. The next morning was our return to where we started, Bangkok.